The Tech X2, the successor to Mono Mini studied for use Cross Country, is a blend of power, progressive, light and reliable. New master cylinder Tech EVO reversible (right and left) with a modified pivot point providing 15% more power, with a dial to adjust the guard and a second lever to adjust the attack platelets. CNC machined from a block of 2014 T6 aluminum commonly used in aeronautics. The pipe clamp and two pieces for easy assembly and disassembly without disturbing the rest of the cockpit. The lever is pierced, a few grams of earned and an aggressive look to the passage, what to do first blush motorcycle cross enduro. The anodizing parts is pervasive levels of sensitive parts, which is a guarantee of quality and reliability, as always with Hope. New bracket also CNC machined in a 2014 T6 aluminum block. It contains two pistons sufficient to give a strong braking size while remaining very progressive, here is a dose braking. 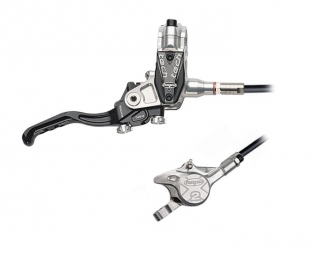 Finally, the inlet fluid connectors are adjustable tilt which is significant to improve the intrinsic performance of the entire brake system depending on the bike.